First good thing about traveling by motorcycle in Colombia is that you don’t have to pay tolls, or you pay less than others (unlike Mexico, Panama and other countries visited previously). As you can see in the first picture, there is a special lane for advancing through tolls for small vehicles. The second picture shows an advertisement for free services for motorists, including towing services and mobile car repair. Pictures 3-4: there are a lot of vintage vehicles on the road, just like in Cuba. But no more US built school buses, they all ended in Panama. Picture 5: there are a lot of full size GMC, Chevy, Dodge and Ford trucks (something that does not exist in US at all, only small pick-ups under those brands there). Picture 6 shows one of the many Dacia 1300 (some badged as Dacia, some as Renault 12) still popular among Colombian drivers! Last, another Romanian car, ARO 24! 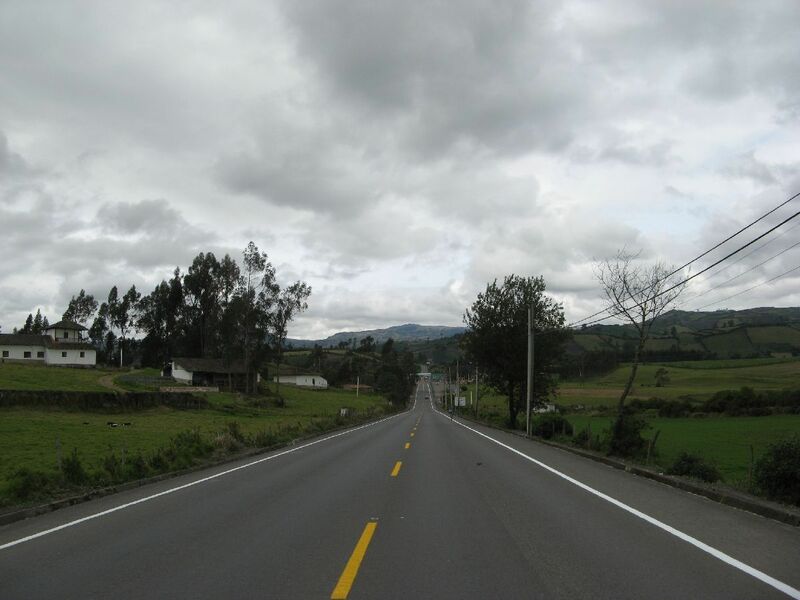 After Bogota we had to go back over the Andes to continue South to Cali on the Panamerican highway. We both agreed this is the most spectacular road we ever been on!!! 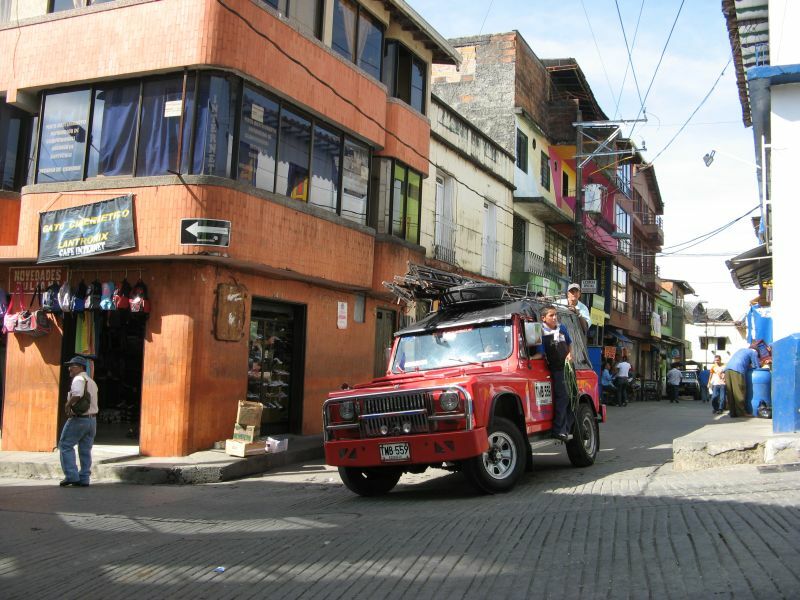 Bogota is a lively city with plenty of historical buildings, wide avenues and, of course, friendly people. Unfortunately, it lacks a rail transit system and it is therefore paralized and polluted by numerous buses. After visiting the old center and Museo del Oro we took the teleferico in order to get a better view of the city. For the sake of variation, we returned with the cable operated railway system. In the last pictures you can see an interesting form of art: hundreds of ants attached to the facade of the building of the Congress of Colombia! The visit was complete after a loop on the periferico, a freeway that goes through the mountains while circumventing the city. The first time we had to cross the Andes was when we went from Medellin to Bogota. The road reached the altitude of almost 3600m. On any road there were plenty of Romanian built vehicles. During our stay at a hotel overnight, we managed to store the motorcycle inside, as there was no nearby parking. Our next stop was in Medellin. Pablo Escobar was no longer there so things were quite smooth. The first day we used Palomina to sightsee various neighborhoods until after sunset. To be noted, some streets are way more inclined than those in San Francisco! The next day we used the public transportation. First the Metro and then the MetroCable, a gondola system servicing the areas where the train can’t go because of the high gradient. All public transport system is very clean and user friendly and all stops are accessible to disabled persons using various elevators. Having the opportunity to see the whole city from above is priceless!! !